Italian niche house Maria Candida Gentile has launched two new unisex fragrances in the brand's Classic Collection line, Finisterre and Noir Tropical. Finisterre ~ "Maria Candida Gentile chose to dedicate this perfume to the Way of St. James, a long path where wanderers often find their way back to a lost dimension between the realms of the sacred and that of the physical. In particular, it is dedicated to the FINISTERRE, the place where you can decide to keep walking for about a hundred kilometers after arriving in Santiago. The local tradition calls for travellers to bathe in the ocean, the then burn a garment they had been wearing during their march, and finally to collect a shell as evidence of their experience..." Featuring notes of marine accord, helichrysum, pine, gray amber and sandalwood. Noir Tropical ~ "A vanilla scent that is far from treacly. It has a natural elegant, vital and passionate peculiarity without any sickly sweet traits. The rum and the almond give it an original character with no compromises. Seductive but not suffocating, its trace wafts upon the skin for long, revealing the characteristics of its nature: vegetable, aromatic and gently gourmand. Vanilla is the femme fatale of a film noir set in the South Seas..." With notes of bergamot, almond accord, vanilla and rum. 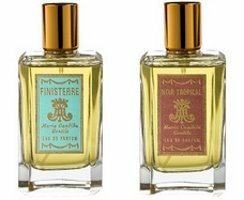 Maria Candida Gentile Finisterre and Noir Tropical are available now at Twisted Lily, in 100 ml Eau de Parfum, $185 each.